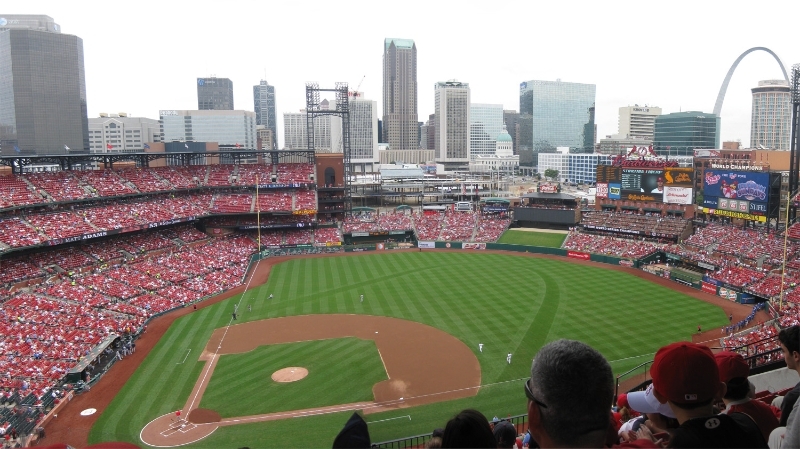 We like visiting stadiums and arenas around the country for many reasons but one of the most prominent is the ability to see what makes a region tick. 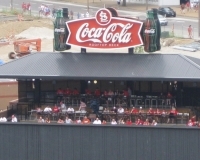 We believe that if you look closely enough at a team, its fan base, and, yes, its stadium, you can really get a feel for a region’s tastes, its styles, its beliefs, and quite simply, its personalities. 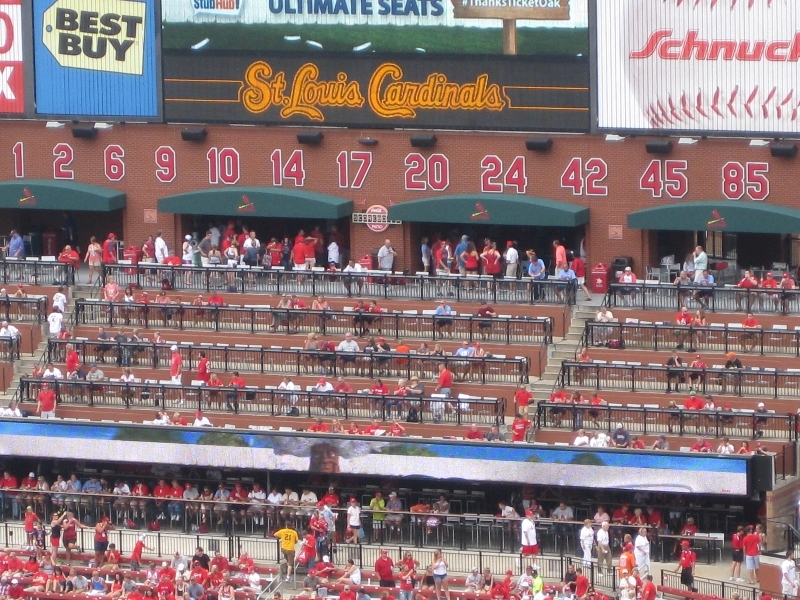 So what does Busch Stadium say about St. Louis and fans of the Cardinals? 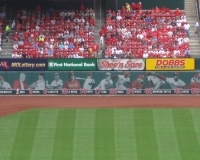 Well, folks are definitely polite, befitting the Midwest feel. 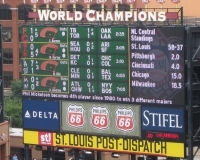 They’re proud as well — having witnessed two championships in a six-season span, they have 11 titles overall to boast about. But “loyal” is the word that most easily comes to mind. 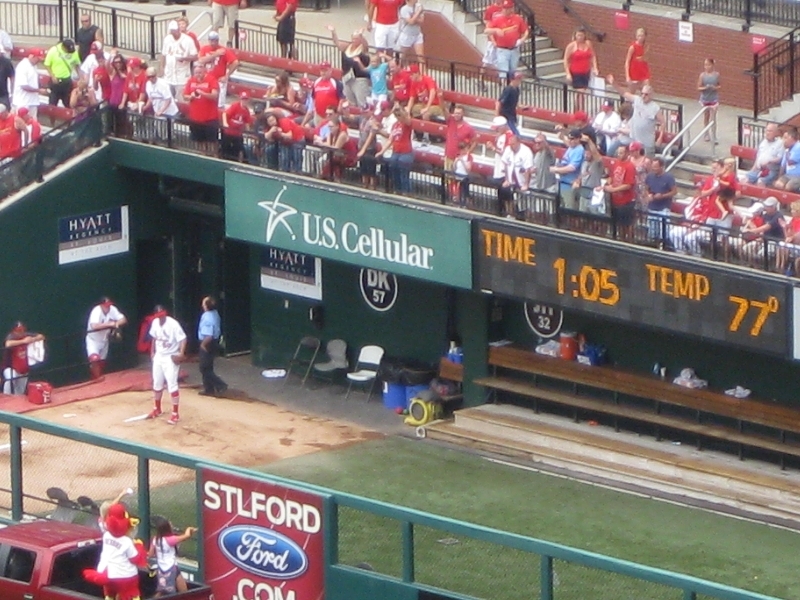 These fans love their team — and that’s not a unique statement, sure, but St. Louis’ love affair with the Cardinals truly delves into the realm of fervent devotion. 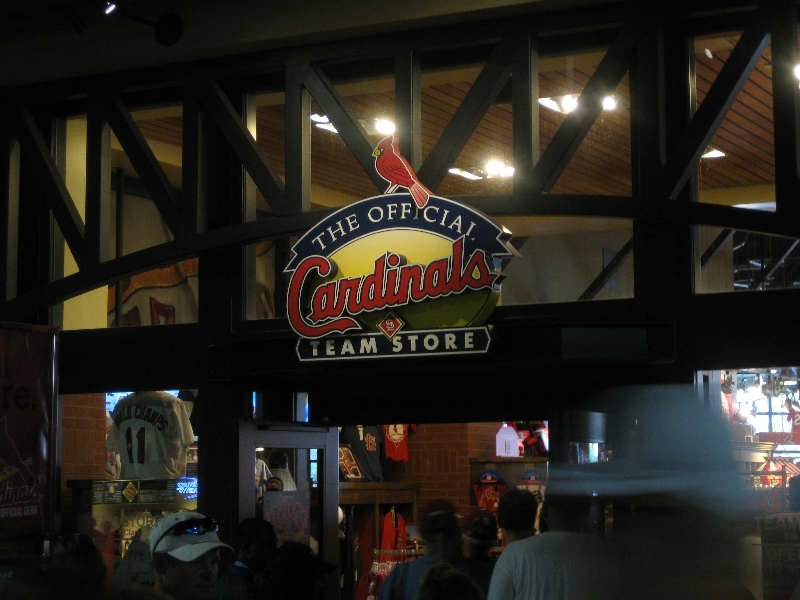 There’s a reason this place has picked up the nickname “baseball heaven,” and while other markets can argue the merits of their team and their fans, they would have a hard time topping the devotion Cardinals fans show their team. 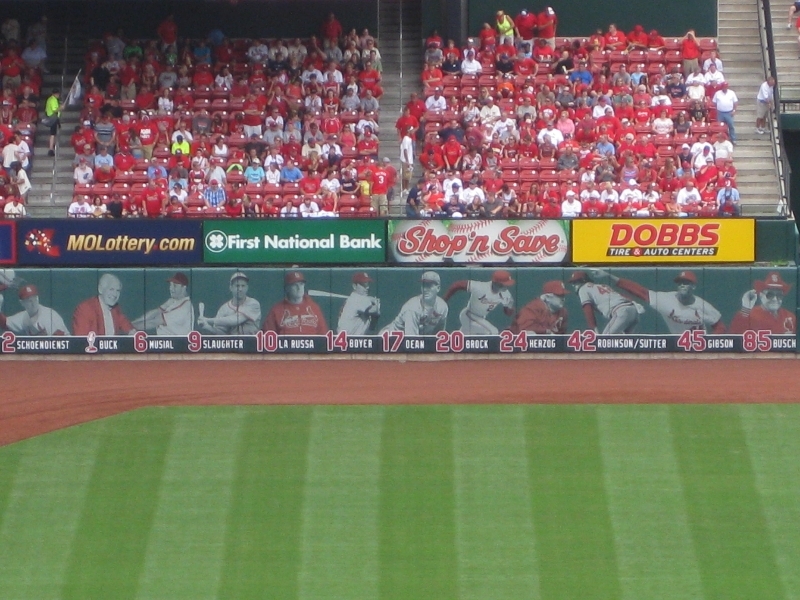 With the “new” Busch, opened in 2006 to replace its cookie-cutter predecessor, you have a veritable shrine to the team, with nods to its history both subtle and obvious at every turn, and very distinctive to the region in which it’s situated. 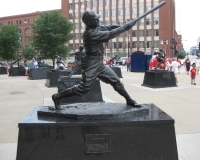 As a visitor, I had a great time exploring what St. Louis baseball is all about. 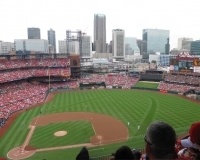 For more on visiting St. Louis, check out our St. Louis city guide. 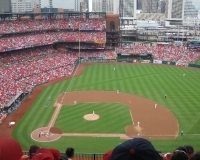 St. Louis is an ideal destination for the sports-fan visitor because of the fact all three of its pro sports venues are downtown, within a few miles of each other. Busch Stadium in particular is ideally located, with Interstate 64 running right by it, two other interstates close by and the glorious Gateway Arch within shouting distance. 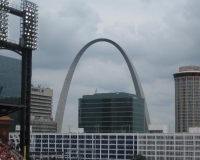 In short, if you see the Arch and you’re on an interstate, you shouldn’t have much problem finding the ballpark. I didn’t have a car, though, and I was staying in a hotel on the western edge of downtown near Union Station — which is no longer a train depot but a shopping/restaurant destination. 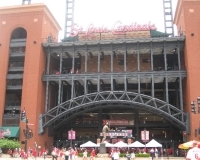 However, it does have a stop for Metrolink, the local light rail service, and if you aren’t driving, there are far worse ways to get to the park than by using it. 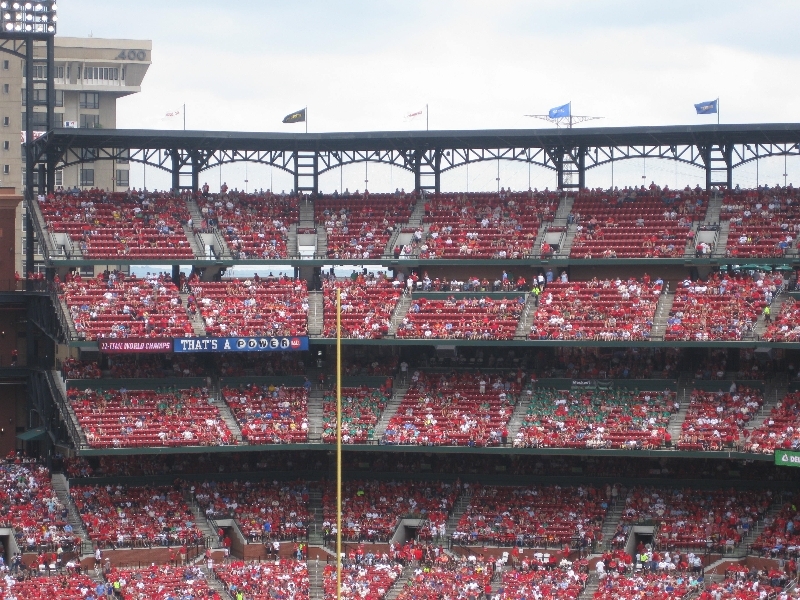 In fact, thousands and thousands of red-wearing Cardinals fans would agree, because I crammed onto the train with them both heading to and leaving the stadium. 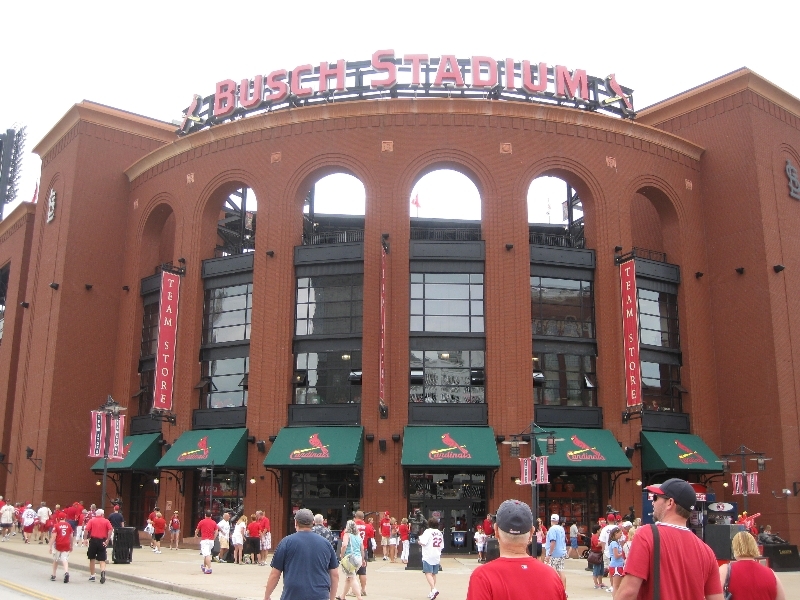 I bought an all-day pass for $7.50 because I had other places I wanted to go — namely, the Arch two stops away — but I eventually made my way back to the Stadium stop, which drops you off right across the street from the third-base gate. Very convenient indeed. 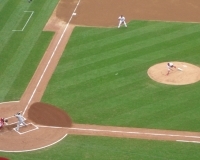 If you are driving, there are plenty of parking options, mostly in independently owned lots on the other side of I-64, and there’s a massive structure just beyond center field that looked mighty busy. 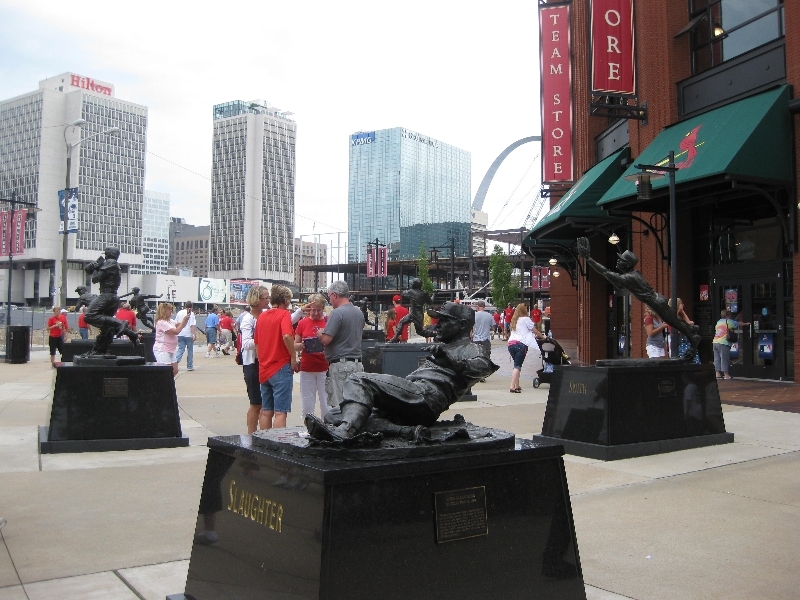 It’s downtown, so there’s plenty to see, do, eat and drink around the ballpark before the game — particularly on a Sunday. 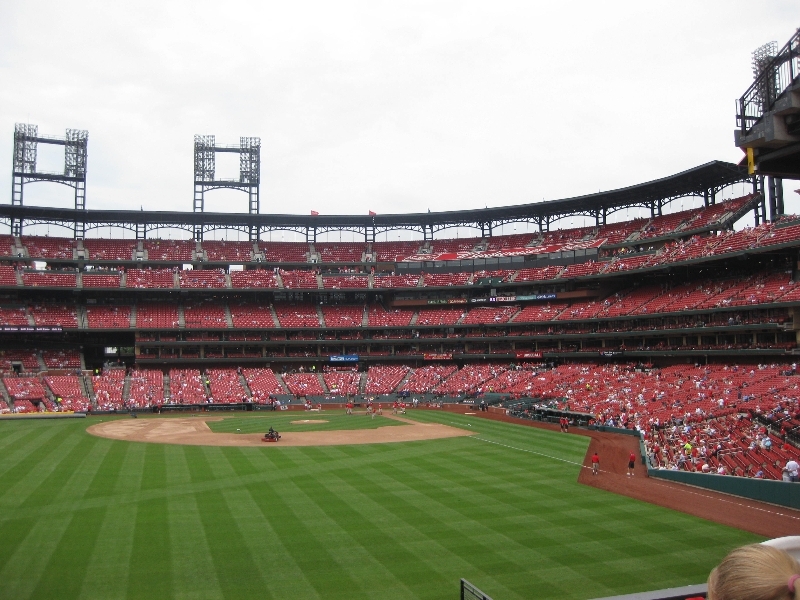 One option: Go visit the Arch, which I chose to do and, judging by the number of people in Cardinals gear roaming the grounds next to and underneath the Arch, so did many others. 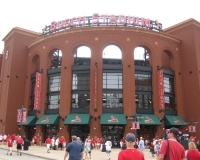 The long lines to get into the museum situated at the base, though, foiled my original plan to go up into the Arch’s observation deck, and I headed back toward the ballpark — a walk of about 5 or 6 blocks — so I wouldn’t miss first pitch. Another option used to be the International Bowling Museum and Hall of Fame, but alas, they packed up and moved away a few years back. 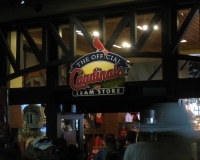 The building in which the museum used to be located, on Stadium Plaza just north of the ballpark, is now a Cardinals team store. 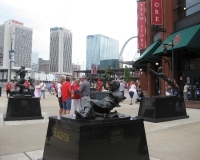 More has arrived just north of the ballpark (the remainder of the footprint of old Busch Stadium) in the form of a “Ballpark Village” with retail, restaurants and residential space. 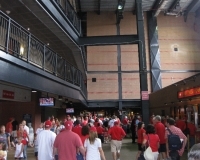 If you’re into people-watching, there’s plenty of that to do, as fans stream in, scalpers try to unload their tickets and vendors hawk their wares — T-shirts, water and the like. 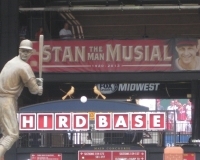 On this particular Sunday, the perimeter of the park was abuzz because of the mini-Stan Musial statue giveaway happening that day — folks without tickets were holding up signs asking to buy statues off people, and I noticed a LARGE number of fans walking outside the stadium with their statues, even though it was clear the giveaway was taking place inside the gates. 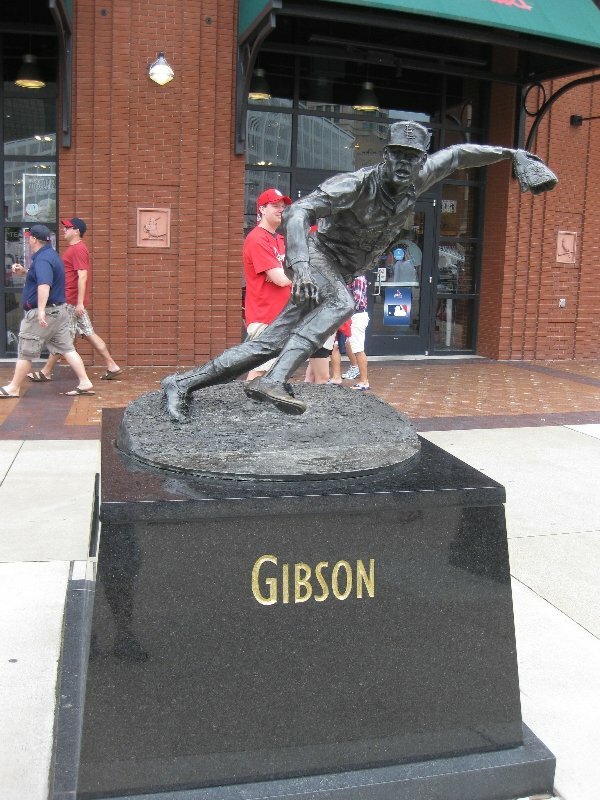 I thought for sure it meant that fans were showing up just to claim their statue and then leaving without sticking around for the game, but the usher who took my ticket told me that I could get my hand stamped and leave the stadium, put the statue in my car trunk, and then come back. 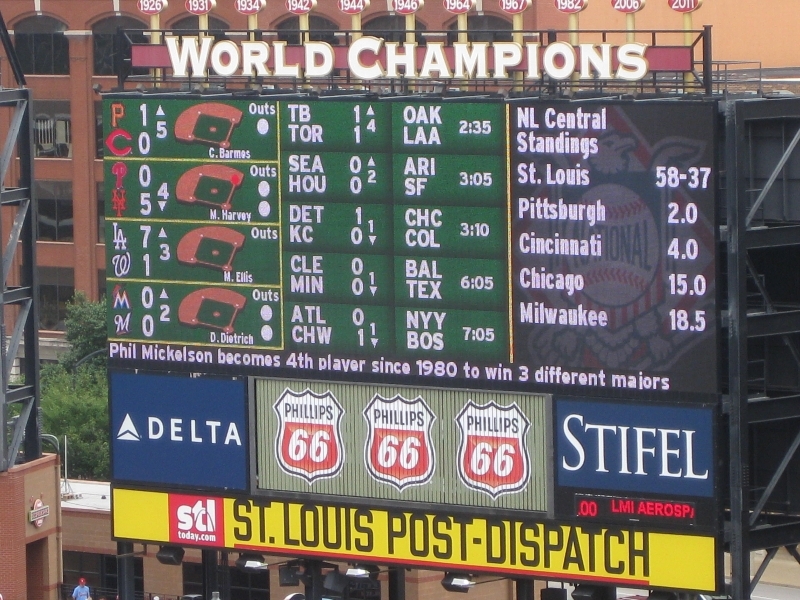 That’s Midwest hospitality for you. 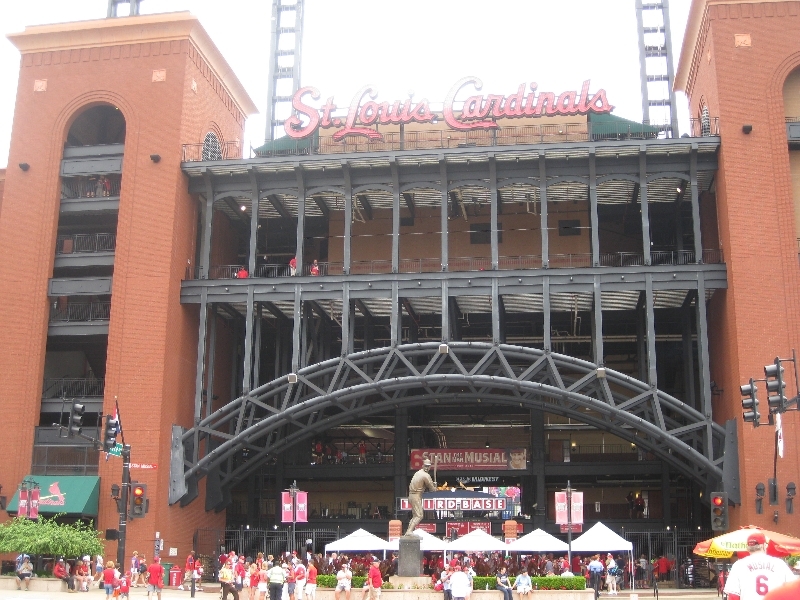 Just a good look at the stadium as you’re approaching reveals quite a lot about it and its place in St. Louis architecture. 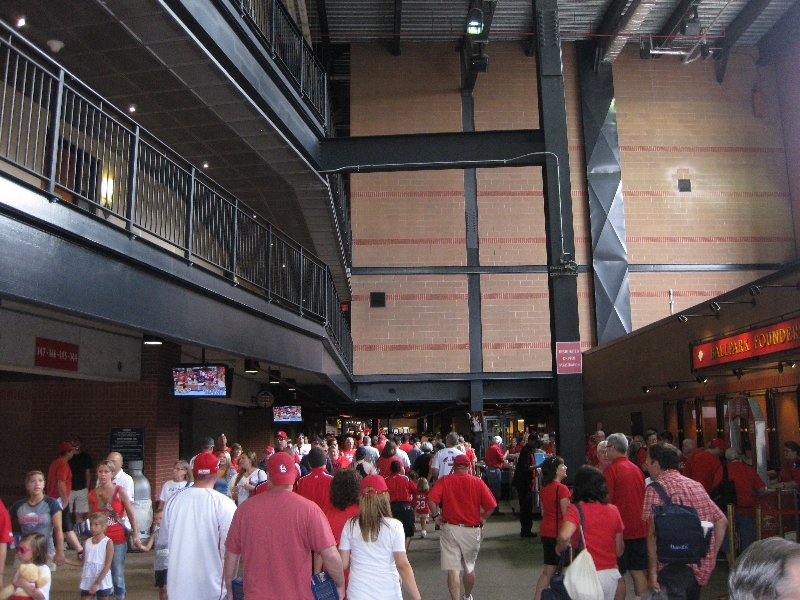 This is particularly true at the third-base gate, as fans enter under a distinctive arched walkway. 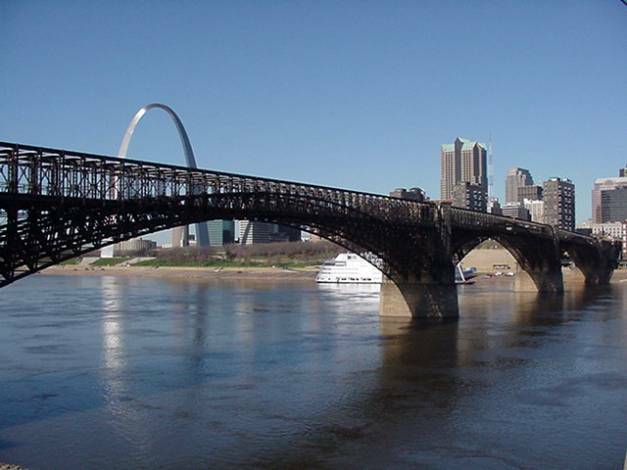 It’s easy to think that the design was meant to mimic the Arch — and, yes, that’s what I thought at first — but it’s actually a nod to the Eads Bridge, a historic structure that crosses the Mississippi River just north of downtown. 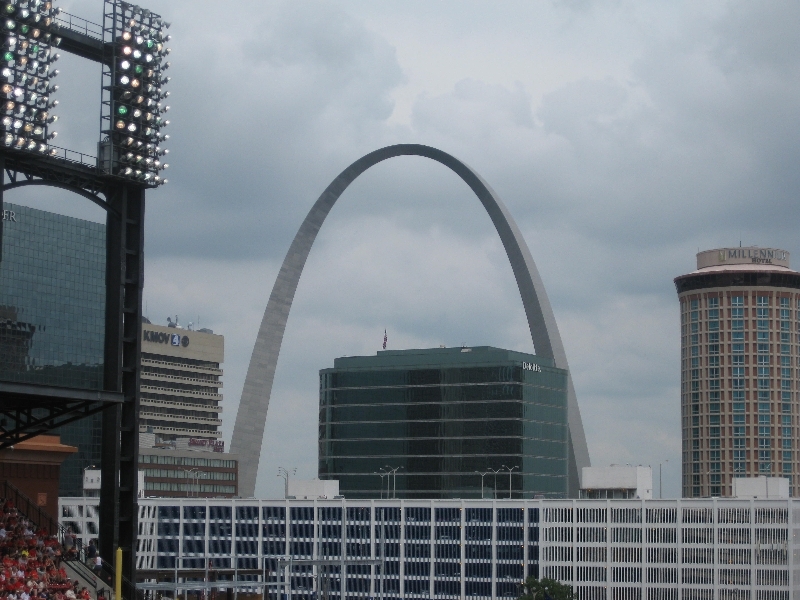 The Arch gets its own nod in the image cut into the outfield grass — and also the quite stunning view of the real thing beyond right-center field. 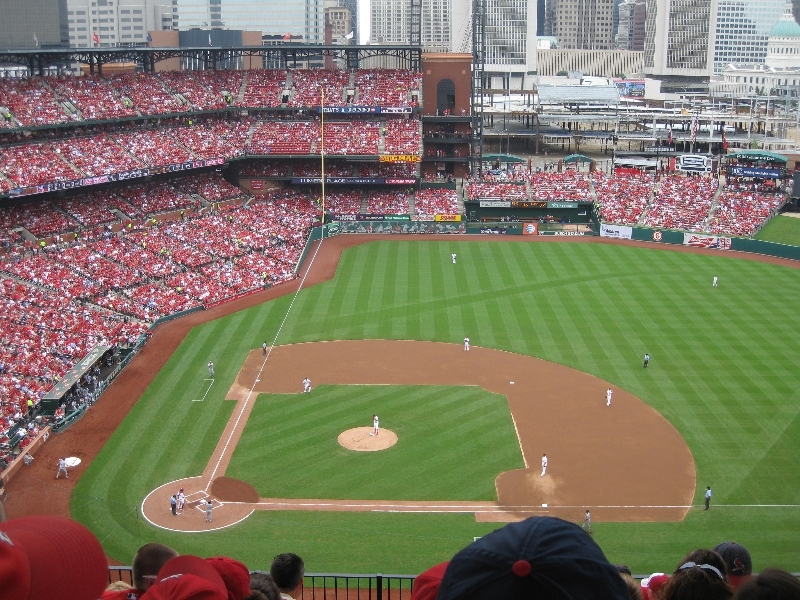 It seems a lot of new-era ballparks were meant to feel cozy, but with Busch this is not the case, and that’s quite all right. 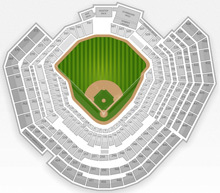 It feels big for a 45,000-seat stadium, and my seat in the 400 level, first-base side, felt high, but not crazy high. 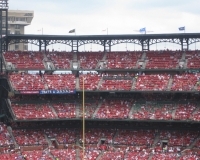 I spent different parts of the game watching from a couple standing-room only spots, and other than having to look over the row of fans in front of me, visibility was not an issue. 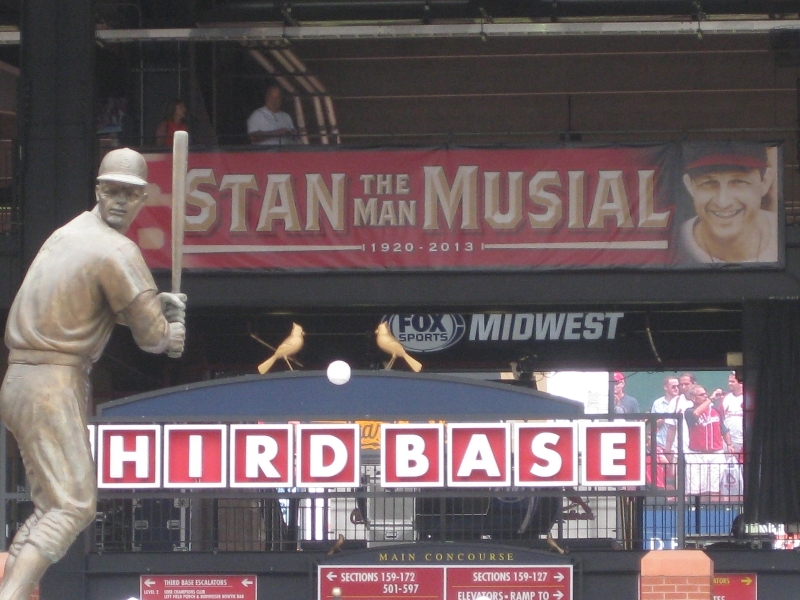 I toted my Musial statue with me to my single seat in Section 445, already knowing that I had no space for it in my luggage. 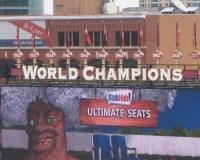 So I intended to give it away to whichever fan I deemed nice enough to deserve it, but none of those fans seemed apparent around my seat. 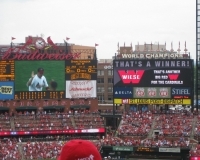 I had a young couple to my right, the woman quite obviously disinterested in the game, the man a little too interested judging by his angry reaction when Cards ace Adam Wainwright yielded a run in the first inning. 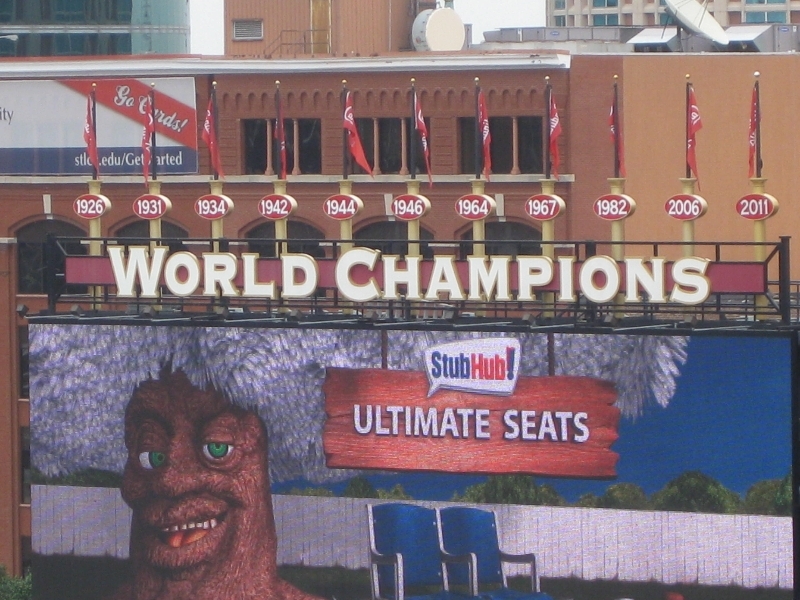 I wanted to say “Calm down, dude, it was just one run!” Instead I focused my intention on the older group that arrived at that moment to fill the seats to my left, but the gentleman who wound up sitting next to me just gave me a rather cold look — because I wasn’t wearing any Cardinals gear, I suppose — and sat down. We sat awkwardly like this for a couple innings before I finally got up, figuring it was lunchtime, and left my seat for good. 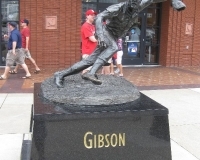 Only around the seventh inning did I realize I had left my Musial statue underneath my seat, and at that point I was on the other side of the stadium and too lazy to get it. 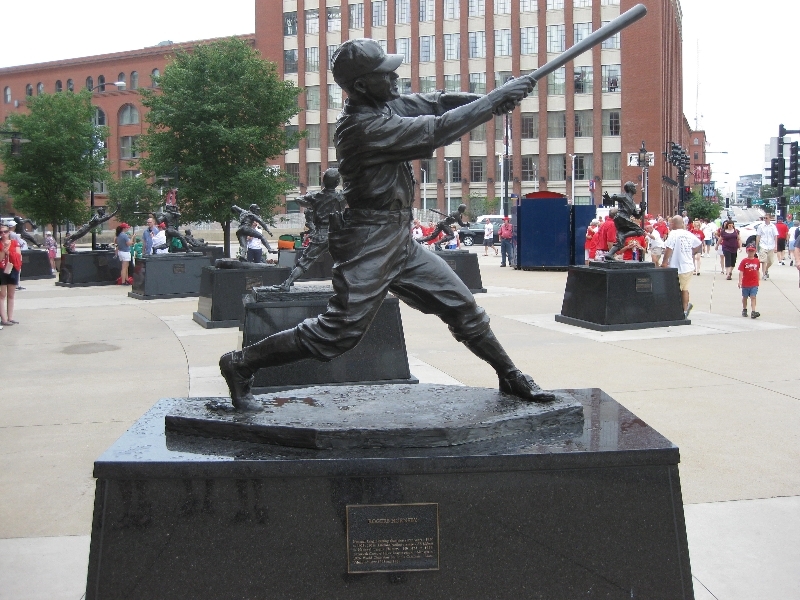 So whichever one of you wound up with an extra Musial statue, I hope you’re enjoying it. 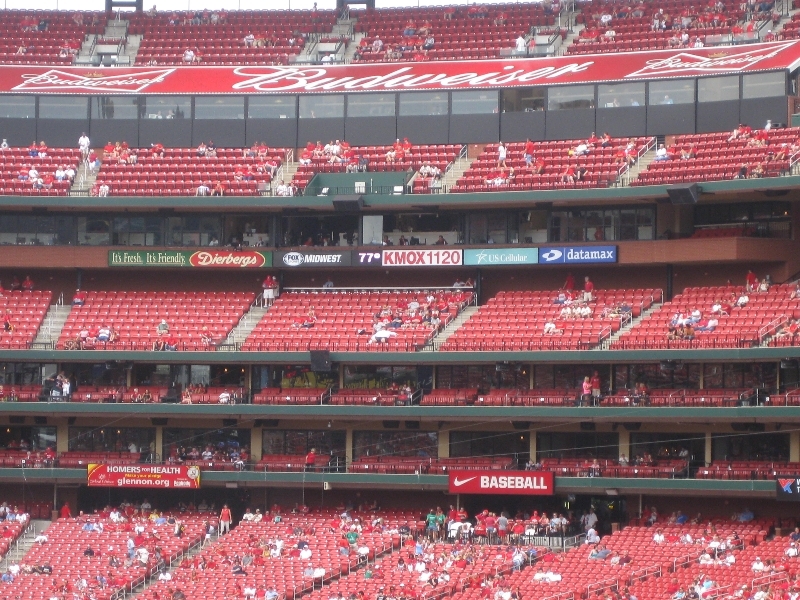 The concessions options, in my opinion, is one of the areas in which Busch Stadium really shines. 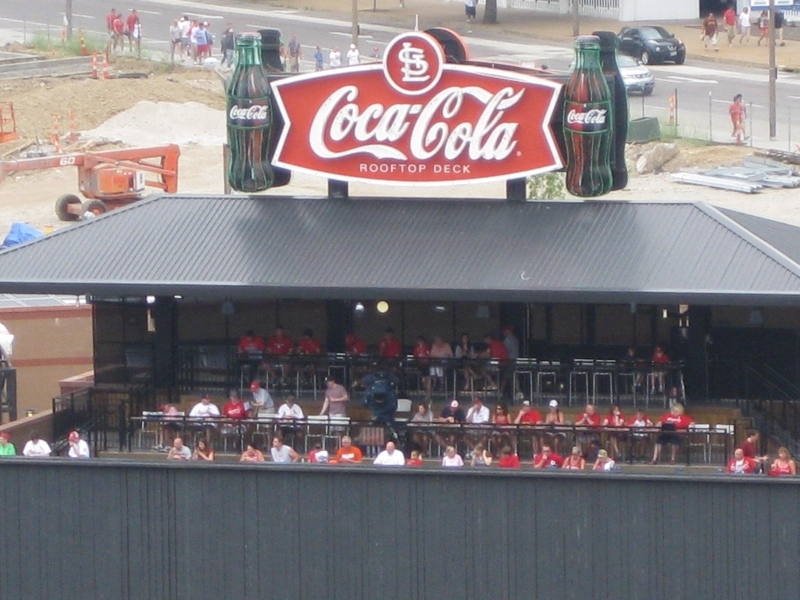 There was a time when I was surprised to see so many varied and rather gourmet options at ballparks, but not anymore, as it seems every ballpark is trying to one-up the rest. 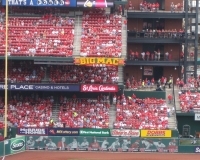 Loaded hot dogs, build-your-own nachos, turkey legs, fried cannelloni (probably a variation of toasted ravioli, a regional specialty in St. Louis), “thickburgers” from Hardee’s — the selection was quite wide. 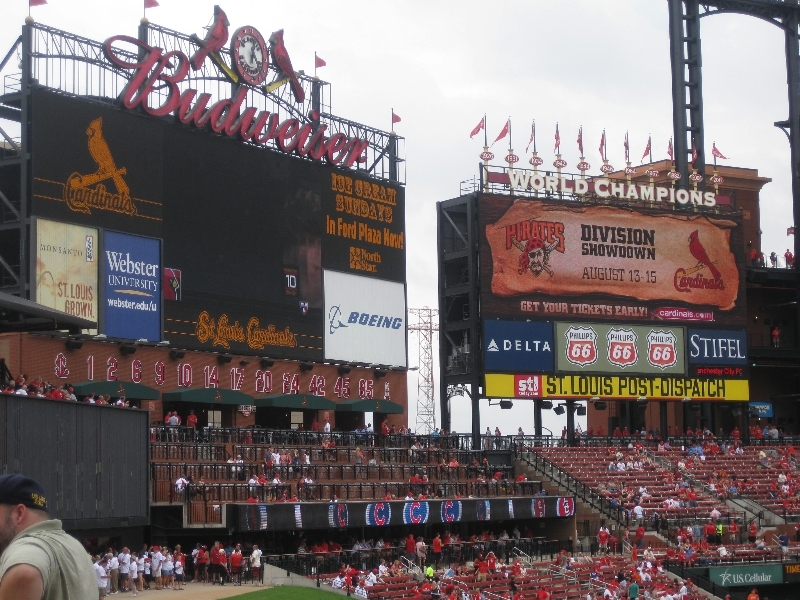 Oh, and Budweiser beer, of course, this being St. Louis and Busch Stadium. 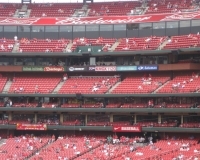 And on this particular Sunday, they were giving out popsicles out on the concourse in center field, though I decided it wasn’t worth waiting in the massive line for them. 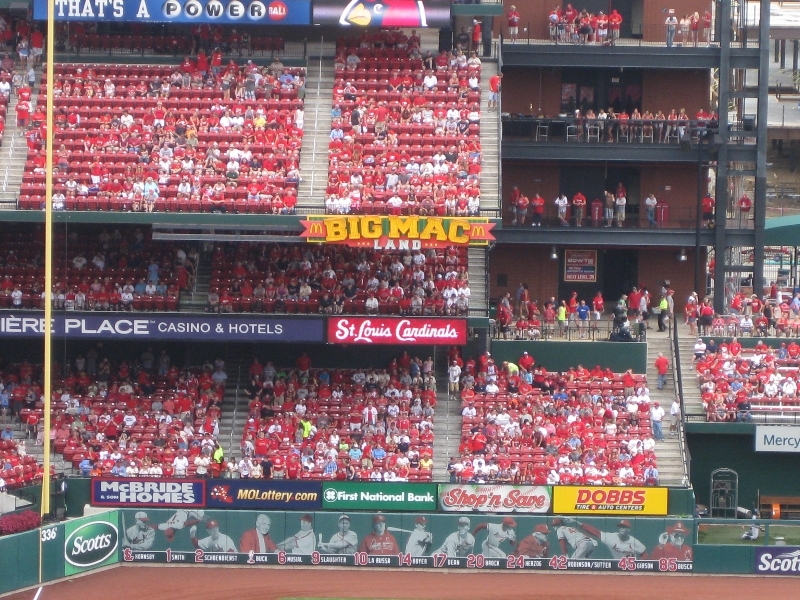 But one item in particular caught my eye: the horseshoe sandwich, which I had heard was a specialty of Springfield, Ill. (close but not close enough to be featured in St. Louis’ ballpark, in my opinion). But it was on the menu, so I had to have it. And even at $12.25, I didn’t regret it at all. Well, maybe I would have if I had stepped on a scale that night. 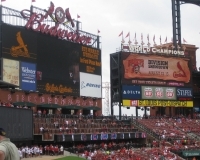 But if this is my one and only visit to Busch Stadium, I’m glad I had a horseshoe. Some chef somewhere needs to get on this whole burgers-on-Texas toast idea — it’s phenomenal. 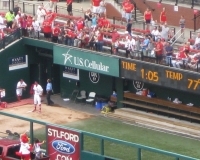 All the Cards fans around had the same satisfying feeling at game’s end, when a catch at the wall for the final out saved their one-run victory over the Padres. 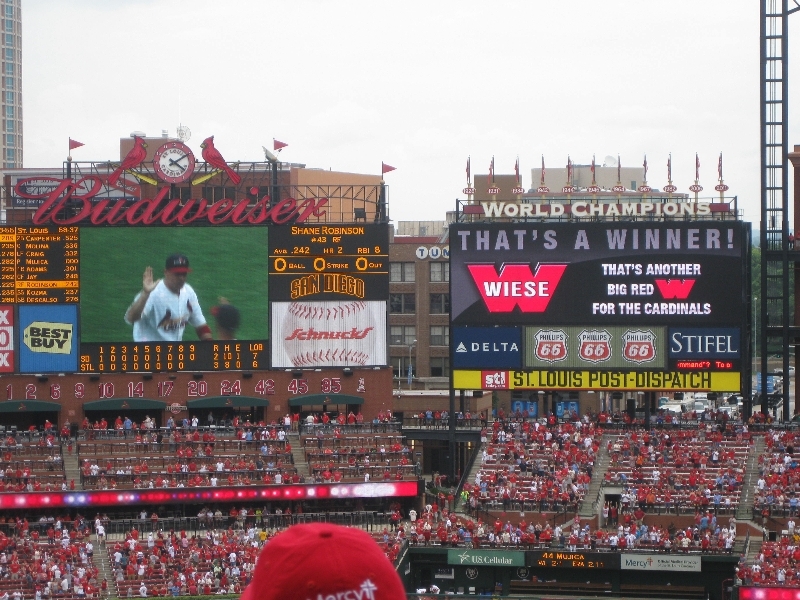 I headed out into the steamy afternoon with all the happy fans, hopped on the Metrolink (the station was crowded but I got on the second train going in my direction) and headed straight for Ted Drewes. 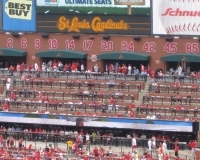 I’d like to think it was as St. Louis a day as a visitor could ever have.